In case you haven't noticed, we are starting to see a bit of slate politics brewing in this election. Some of it is idealogical common ground, but some of it is simply a marriage of convenience. A few candidates have their signs strategically placed together and in the case of one state representative, she is even helping the opponent of her political rival. State Representative Marissa Marquez is playing a key role in the campaign of Naomi Gonzalez who has an uphill battle brewing in her bid to unseat State Representative Norma Chavez. Thats a pretty interesting turn of events when one considers that it was just two short years ago when it was Chavez helping an upstart candidate take on another long-time state legislator who was a political rival of Chavez, State Representative Paul Moreno. 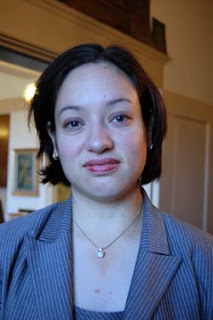 For some unknown reason, State Rep Marissa Marquez escaped this round of elections without an opponent. 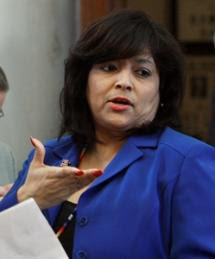 That leaves her free to help a challenger take on her rival, State Rep Norma Chavez. Marquez has apparently taken Gonzalez around Austin introducing her to key individuals and is also playing a role in fund raising. Gonzalez is a trial lawyer and has now received contributions from a rather conservative group, Texans for Lawsuit Reform (TLR). TLR was a major contributor to Marquez's campaign in the last election. Marquez has long been rumored to be a pretty conservative Democrat considering some of her stands on issues and her relationship with a Republican colleague in the house. Shopping Gonzalez around to similar crowds makes sense for Marquez and Gonzalez because Marquez wants an ally and to eliminate a rival and Gonzalez needs the money. In a bit of political gamesmanship, Representative Chavez herself walked a precinct of particular import to Chavez. She walked precinct 82. That’s a precinct that Chavez won with 83% of the vote in the last election. Its also the precinct where her main opponent, Gonzalez lives. Candidate for District Clerk, Connie Telles-Odom, was present at State Rep Norma Chavez's campaign headquarters on Saturday. Telles-Odom was in attendance to walk a precinct in support of Representative Chavez's re-election bid. I didn't see any of Telles-Odoms' materials with her so there was no indication as to whether she indented to kill two birds with one stone, but given Chavez's popularity in the valley, it wouldn't surprise me if Telles-Odom did a little double duty. Given the proximity of early voting, its very likely that Telles-Odom was also passing out her literature in addition to Chavez's. I know that's what I would do if I were in Telles-Odoms position. Larry Medina has been making the rounds at the various campaign forums where he is usually warmly received by people in attendance. I've personally heard him asked more than ten times about why he dropped out of the race. Medina politely answers the question when it comes from regular people. He got in to a little spat with David Crowder last Saturday over another issue, but cooler heads prevailed and the two eventually sat next to each other over breakfast for a short while. 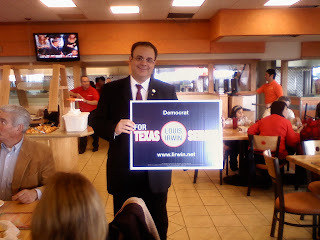 As you can see here, Louis Irwin's campaign sign is being held by Larry Medina. No word from Medina as to whether one should consider it an endorsement, but it was a pretty light moment after an eventful form. 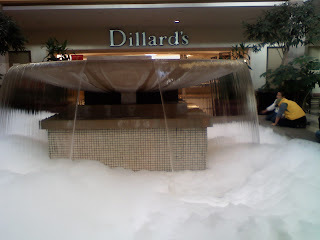 Last weekend I Tweeted about someone putting soap in the wishing well fountain at Cielo Vista Mall. I forgot to post the pic of the fountain. Here it is, sorry the pic isn't the greatest quality, all I had was my cell phone camera at the time. I got some real good advice about my coverage of local politics today. I get a lot of criticism. When its constructive, I really do appreciate it. The critique I got today was very well deserved and opened my eyes to something I was doing that I hadn't really noticed was happening at that time. As a result, I'll tighten up my shot group. People have come to read my blog because of my coverage of local politics and lately I have been a little focused on the race for County Attorney. I don't regret my coverage for one minute, and will continue to cover it. But I really should write a little more about some of the other races, especially during this campaign season. So lets examine the state senate race which is a race to determine the successor to Senator Eliot Shapleigh. The Republicans have Dan Chavez. The Democrats have Jose Rodriguez, Louis Irwin, and Liza Montelongo. Jose Rodriguez is the favorite in this race and the likely victor. Irwin and Montelongo have several obstacles to overcome in order to make this race competitive. One of the candidates has a stronger academic background than the front-runner and the other candidate has more policy-making experience. Rodriguez has more name recognition, money, and has a bigger base of supporters. Rodriguez is the only candidate in the race that has won a county-wide election. In fact, he's won several as El Paso's long-time County Attorney. Montelongo has little money and Irwin even less. Montelongo has a base of supporters as a member of the Ysleta Independent School District Board of Trustees. Her base is decidedly smaller than Rodriguez's but its something she can build on. Irwin has run for office before but hasn't made it in to the win column as of yet. The challenge for Montelongo and Irwin, in addition to the aforementioned obstacles, is how to distinguish themselves from Rodriguez in terms of policy. For the most part, the candidates all sound the same. The reason is that there hasn't been much discussion of specificity when it comes to policy and their individual agendas. Without specificity, there really isn't a way for the candidates to separate from their opponents. Then there's the problem with not having the money to get that message out to the public. But the fact that there isn't much specificity from the senate candidates is a bit of a self-inflicted wound. The candidates don't really do much to talk about specificity when given the opportunity. That's their own fault. Irwin is the only candidate that I have heard any amount of specificity from. But as the saying goes, the devil is in the details and Irwin's specificity may not endear him to a lot of voters, mostly because he has the courage to tell the truth, increased taxes may be something we see in the horizon. Republicans in this state will probably do anything they can to prevent that, but Irwin has very boldly made it part of his platform. He talks about making cuts and other complexities of a budget plan, but the only thing voters are going to hear is a tax increase. Montelongo's danger is that she's one-dimensional. She has a strong command of education issues but has to hit the books on some of the other issues affecting the state and the region. She'll be on my program later this week, but I did have an opportunity to interview her last week. She got me confused with another host, the new Hector. Eventually she figured out who I was and we spoke briefly. For the most part she did pretty well, but she stumbled on a question that EVERY candidate for any office should be able to answer. I asked her what is the first bill she would introduce if she were elected senator. She wasn't able to answer the question. I'll give her another stab at it when she comes on my program on Thursday. Each of the candidates have to get voters to take their candidacies seriously. Many thing Montelongo is not ready and Irwin is not viable. Their campaigns have to change that sentiment among the voters. Rodriguez's opponents are under the impression that Rodriguez is taking them lightly and seem bothered by that fact. If he's taking them lightly, that is a good thing for Montelongo and Irwin. Honestly, if Rodriguez is taking them lightly its not something he'd ever admit publicly, but it wouldn't be surprising. Rodriguez's biggest threat is falling asleep at the wheel. He will likely win without a run-off, but we are starting to see a bit of a slate arise that is attempting to make this election a referendum on Team Shapleigh. If you listen to people like Rick Ledesma and Theresa Caballero when they campaign, you will notice that they blur the lines of the campaigns and will frequently mention candidates from races they are not involved in. Rodriguez has to keep his eye on that and not be drawn in to the deep waters of crazy. Rodriguez has to show that he will be his own guy and not just a brown extension of Senator Shapleigh, which is exactly what some people will attempt to portray him as. It would be unfortunate if that happened because Rodriguez has a very compelling story, going from the fields as a migrant farmworker and likely to Austin as our next senator. The big money guys in town are backing Rodriguez and that opens him up to a critique of an association with Republican money-bags in a mostly-Democratic town. Its not impossible for Irwin or Montelongo to win, but a lot of things have to go their way in order for them to get to victory circle. No candidate should simply waltz right in to office and our community deserves to have a rigorous debate about ideas. Even if they don't win, Montelongo and Irwin can serve the community by raising issues, forcing a detailed debate, and giving voters something to think about when they vote. 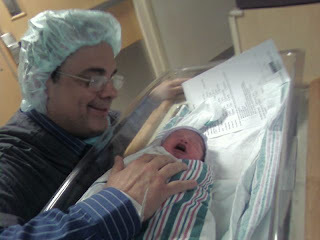 Larry Medina and his wife, Ruth Reyes-Medina welcomed a son in to the world yesterday evening. Kennedy Christian Medina and mom are both doing well and resting comfortably. No word from Kennedy as to whether he will be seeking a business, political, or legal career in the future. This is the first pic of father and son. Since I am having a hard time getting an interview with Caballero these days, I thought I'd just throw some of my questions out there to see if perhaps she will address them at some point. TC has talked at great length about conflicts of interest. So lets examine the other side of the conflict issue. Its nice that she talks about conflicts for issues like Ethics Commission, but I'm curious about another scenario. I'm wondering what her position will be about pursuing corruption. She's talked about that pretty regularly, but what about some of the people she's been associated with. Will she pursue cases against them in the interest of seeking justice, or will she say there is a conflict. Case in point, the Catalina land deal. Some of the people she's been associated with are defendants in that case. If she is elected County Attorney, what happens to those cases? Does her office continue pursuing the issue or does the case come to a halt. If she does pursue the case, how vigorous will the prosecution of her associates be if Caballero is elected County Attorney? More importantly, what is in the best interest of the community of El Paso? Since Caballero is so vigilant about corruption, to the point that she actually uses it on campaign materials, I'm wondering what happens in a case like the Catalina land development deal? Okay, I'm not exactly jumping for joy at the results of last weeks election of Scott Brown to be the new senator from Massachusetts. But there is a lesson to be learned with Scott Brown's victory and some others around this country, like Houston electing its first openly gay mayor and yes, event the Tea Party Movement. Here's what brown people, La Raza, can learn from those people: organize and vote and you can change the leadership around you. The problem we have in our community is that we don't channel or direct our collective coraje in the right direction. We direct it in to our own community or within our own leadership. Actually, what's worse is what happens far more often. We give up and become apathetic. We make the biggest and most damaging mistake our people can possibly make. We stop going to the polls. This is an important message at any time but particularly in this election season. We have the power now to set the table to become more relevant on the national scene. Candidates will have to court our vote. El Paso will become a must-visit, instead of a place candidates drive through on the way to Las Cruces. There's only one way for us to do this. Its something you've heard me say before. Theresa Caballero is used to getting her way by bullying people around. She pulls this whole Devil Wears Prada kind of thing with people and they cower to her brow beatings. Personally I hate bullies. They like to throw their weight around as long as no one stands up to them. That seems to be an innate quality of Theresa Caballero, but I think her campaign against Jaime Esparza only fed her bully mentality. He basically rolled over and played dead for her. She wasn’t going to show up to City Rep Emma Acosta’s candidate forum this weekend because she was going to have to participate in a forum moderated by David Crowder. Caballero is having a hard time dealing with her opponent Joan Bernal in debates and didn’t want to have to be in the same room as Crowder. I guess she felt like she wouldn’t get a fair shake. That seems to be a theme with Caballero, but more on that later. So she bullied Acosta in to giving in to her wishes and Crowder didn’t moderate her debate. But as you can see in the video posted in a previous post, the bully was crying for help from Acosta when it was my turn to ask a question. I never got to answer my question. So here’s the ground I was going to cover. Theresa Caballero filed motions with the court to recues the judges in the two courts that have exclusive jurisdiction over juvenile, orders of protection, etc…In other words, the courts’ dockets are driven by the county attorney’s office. In Caballero’s opening statements she talked about the liabilities in the county, specifically as they relate to the only issue she seems to want to talk about on the campaign trail, the embattled county coroner. Know whats interesting about Caballero’s statements about liabilities? The fact that if Caballero is elected county attorney, she might just be the biggest liability the county of El Paso has seen in a long time. There are a couple of reasons I say this. First of all, a judge actually ruled in favor of Caballero and her tag team partner, Stuart Leeds. The judge ruled that Leeds and Caballero won’t get a fair shot in those courts. One of the main responsibilities of the county attorney’s office is to deal with cases that are handled in those courts. Will she continue with the recusals because she feels she won’t be treated fairly, or will the county of El Paso be stuck with the bill to hire outside attorneys to handle all of those cases? The cost to El Paso tax payers would be ASTOUNDING! Its interesting to note that TC has made a lot of money off of cases she was appointed to by the county of El Paso. Then there’s the fact that TC has put in complaints against Commissioners Escobar and Perez, along with District Attorney Jaime Esparza and a host of other county officials. All of these people would be her clients if she was elected County Attorney. Caballero’s argument when it comes to the Ethics Commission and the county attorney’s office is that the CAO shouldn’t advise the Ethics Commission because of an inherint conflict. So by that logic, she would not be able to represent the county in cases that involved the aforementioned county officials. The tax payers of El Paso County will have to pick up the tab for outside representation. And what about the Sheriff’s Department? Will she have a conflict with the SO now that she has gone on record dissing the El Paso Police Department? Our Sheriff is the former Chief of Police over at EPPD. As far as I am concerned, TC is a liability to the tax payers of El Paso County. Man, I didn't even get a chance to ask my question! Despite the fact that he kept trying to walk away from me, I was able to get an interview with Jaime O. Perez after a debate the other night. It was a straight-up interview. I asked him about his candidacy. For some reason many Republicans still look at JOP with a bit of trepidation. Let me assure my friends from the other side of the aisle, JOP is absolutely one of you guys. Not only is he one of yours, (it pains me to say this) he seems to have a pretty good command of the issues. One of the things he said that I actually (here I go again) found refreshing, was his declaration that he was going to talk about the issues and not stuff that has no bearing on the race. Lets see if he sticks to his guns. He's not going to be anywhere close to winning, but he'll make things interesting just by having his name on the ballot. Fiscal issues are what he seems to be most focused on, the question is what his approach will be. He went on record as saying we aren't ready for a tax cut. So will JOP's plan for the County's financial woes be cuts and no tax increase? Can we get through this rough spot without a tax increase? What might be the most interesting aspect of JOPs candidacy is the fact that he identified himself as a Libertarian to a degree. Will mainstream Republicans accept JOP as one of their own if he is of a Libertarian bent? Or will that self-identification further marginalize him? I've refrained from talking about the whole Conan V. Jay scenario play itself out on late night television. Many have asked me why. Well the answer is simple, I don't care. Because only viejitos care about late night television on network television. Everyone else watches cable anyway. But for some reason, old people are really paying attention to the late night drama, which is weird because they are usually falling asleep around 9pm. But I guess the late night television wars are a little like the teenage drama Twilight. My daughters have their little mock rivalry of Team Edward and Team Jacob. I'm thinking of selling t-shirts at the old folks home that say Team Conan and Team Jay. If you ask me, most people in Hollywood are blood suckers anyway! This is only temporary folks. I am doing some upgrades to my blog, but its going to take a while. I am going to post stuff here for a while, sorry for the inconvenience. Stay tuned, much more to come!